BELLEVILLE, Ont. (30/01/2012) - Sara and Katie Svoboda recently tried out for the first Ontario Provincial rugby 7’s team. 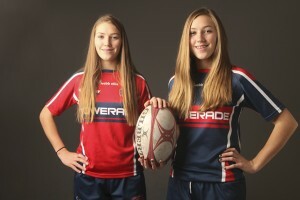 Last summer they both played with the U-16 provincial rugby team, the jersey for which they’re wearing. The Olympic dream of Rio de Janeiro seems a real possibility with the opportunities they’ve had this past year. Photo by Amielle Christopherson. About 40 youth with a passion for 7’s rugby tried out on Jan. 26 at Loyalist College for the privilege of playing for the provincial team at the Ontario Summer Games. Among the group who showed up at the Sports Dome were Katie and Sara Svoboda, 17-year-old Grade 11 twins from Centennial High School. The sport is a newer version of traditional rugby, with seven instead of 15 players and a game time of 15 minutes (including halftime) instead of the usual 80 minutes. It’s also the newest addition to the 2016 Olympic Games in Rio de Janeiro. Beth Bartz, who is the co-coach of the women’s team for eastern Ontario, as well as the rugby coach at Queen’s University confirms that kids who are accepted onto the provincial teams do have a better chance at hoping for that Olympic team. “There are coaches at these games, and kids start getting invited to summer camps, universities, and then the potential for Rio. “There’s a lot of talent in this area, and we know that,” said Bartz. Each of the four regions in Ontario will select 125 athletes, for a total of 500. From that group, 192 will be selected, with 48 from each region, half which will be male and female. They will then be formed into two teams of 12. The Svoboda girls are well-known in the area for their athletic abilities. Between volleyball, soccer, hockey, track & field, cross country, and now rugby, the girls have tried almost everything there is to offer. Sara was on the provincial soccer team in Grade 8, while that summer, Katie made the all-star basketball team. Katie’s also been to OFSAA with track and field, and last summer, the twins both made the U-16 rugby provincial team. Their father, Paul, got them into sports and they’ve been doing rugby summer camps since Grade 5. Sports are definitely in their future and the thought of not being active is something that they don’t like. Sara was out with a sprain for three weeks during hockey season and couldn’t wait to get back on the ice. Asked what being on this team would mean for them, both girls light up and start talking over each other a little faster. “Being on the Olympic team,” starts Sara, while Katie jumps in right over her.